Grab your pencils and pens. Make a comic. In one afternoon. "Mini-comics have been democratizing the art of making comic books since the '70s or earlier… with the popularization of photocopiers, it became apparent that anyone with an inclination and some spare change could print a little comic book. Wildly varying in both form and content, mini-comics are a wonderful synthesis of cartooning and hand-made art objects." 7000 BC will present New Mexico's only Mini-Comics Day event on Saturday, April 9 from 1:00–5:30 at the Lomas Tramway Library in Albuquerque. No rules, no formats, no required subject matter — only fellow creators and resources to help and inspire you. Show off New Mexico's creativity and create a comic that you can print and distribute. Some supplies will be available and there are photocopiers at the library. 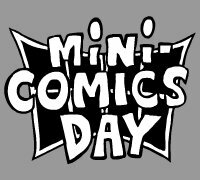 You can prepare yourself by reading about Mini-Comics Day at the official site and checking out the resources. If you plan on participating, please send an email. This will also serve as 7000 BC's monthly meeting.